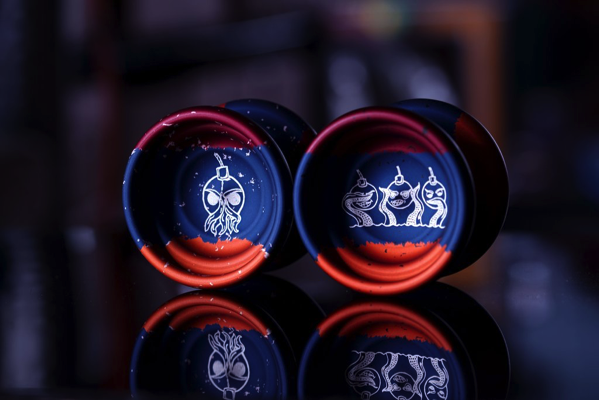 YoYoExpert Blog & Yo-Yo News – New YoYoWorkshop CTHULHU Releases 7/28! The VonBoom Cthulhu is a commemorative design for Armenias 100th anniversary of their first independence in 1918. The colors are the Armenian flag. These were done to celebrate my heritage and honor my Grandfather who was a key figure in events leading up to the independence 100 years ago. The engraving with the one bomb is a mash up of the VonBoom bomb and Cthulhu. ‘Boomthulhu’. The specks are for a more distressed look. Symbolizing Armenias resilience. The other engraving is a take on the 3 Monkeys; See no evil, Hear no evil, Speak no evil. With a cleaner flag for a optimistic modern look. Starting anew. This was my first YoYo design that’s gone beyond just art. I hope you enjoy it and my story. Thanks for supporting us here at Yoyoworkshop. RELEASING SATURDAY 7/28 @ 8PM EDT! !